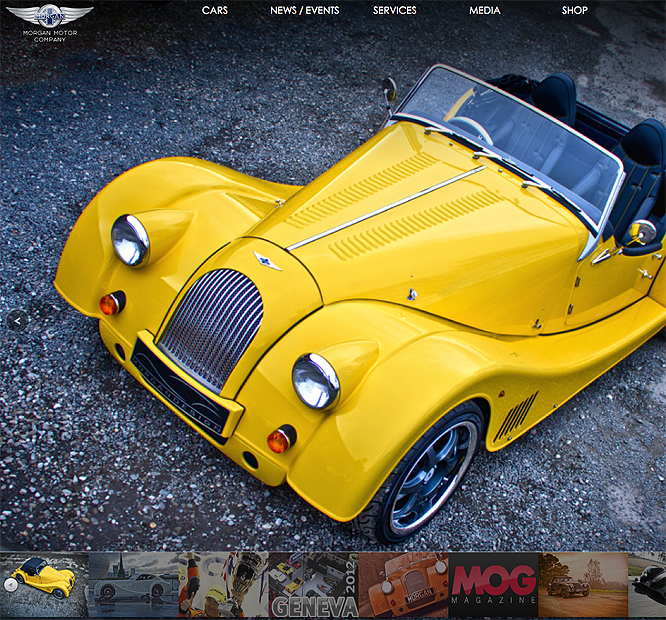 Morgan Motor Company Ltd wanted to improve on an existing web presence by increasing site interactivity and control of content, making it a truly dynamic site worthy of the prestigious Morgan marque. Easy access to information is available to new visitors, existing owners and Morgan dealers alike by utilising a powerful database which handles everything from the Latest News & Media (press releases), details of Morgan owners clubs, new vehicle orders from dealers, a used vehicle locator (constantly updated by Morgan dealers) through to online shopping for Morgan merchandise. Dealer site visitor statistics showing how many times a dealers page has been viewed and the number of clicks thru's to the dealer's own web site. "We contacted Sure Communication to develop a web site which we could take control of. Our previous site looked the part, but did not allow us to simply update the site. We are a high traffic site and wanted to add to the Morgan experience of being in touch with the factory and Morgan world. The speed and ease that we can now post news & pictures is a positive pleasure to use, and what Sure have done is to integrate the behind the scenes areas of the site into our other systems and what a difference it has made to our business." "I would like to put into writing my congratulations for the re-development of the Morgan Motor Company web site. A number of people outside the Morgan world have already commented on it being one of the best vehicle manufacturers sites on the web"